Well, this wraps up my Red Velvet mini-series. 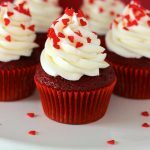 But don’t you fret, I still have plenty of Valentines recipes coming that I am really excited for, like the red velvet cupcakes. After all, tomorrow is the start of February…or Singles Awareness Month as a lot of people refer to it as. 1. Preheat oven to 375 degrees and line pans with parchment paper. 2. In a large bowl, combine cake mix, eggs, oil and vanilla extract. 4. Drop into powdered sugar and cover with the sugar, then place cookie sheet 3 inches away from other dough balls. 5. Bake for 7-10 minutes and let cool. 6. Filling: Beat cream cheese and butter until smooth. Add vanilla and slowly add powdered sugar until you reach your desired consistency. 7. Pipe onto the bottom of half the cookies, sandwich with another cookie and then roll in coarse sugar to decorate. Nice. Got a work potluck coming up. Might need to make these! 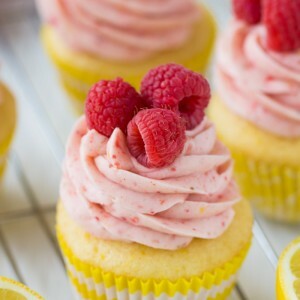 Oh m Lizzy… these look AMAZING! 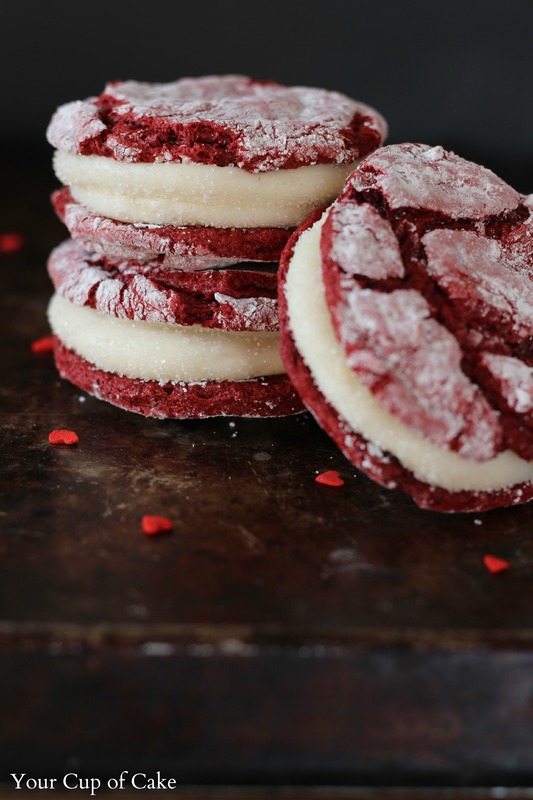 By far my favorite of your red velvet series… which was wonderful, by the way! So Lizzy… I loved this post SO much that I shared it on Google+ and broadcast it out to the WORLD! Now I’ve got about 200 people asking me why you aren’t on Google+!! HELP!! Just made them today. They were a huge hit. Thank you so very much. They are as tasty as they are beautiful. Have been asked to make more. For me that is the best compliment to get. Made these over the weekend and took them into work on Monday – they are getting rave reviews! So easy to put together and delicious!!! 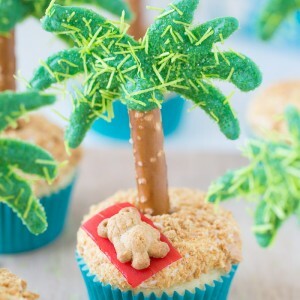 Made these today for our B&B guests… so cute and easy and most importantly, delicious! Thanks for sharing the recipe! We found it on Pinterest! These look so incredibly scrumptious! Love your site. 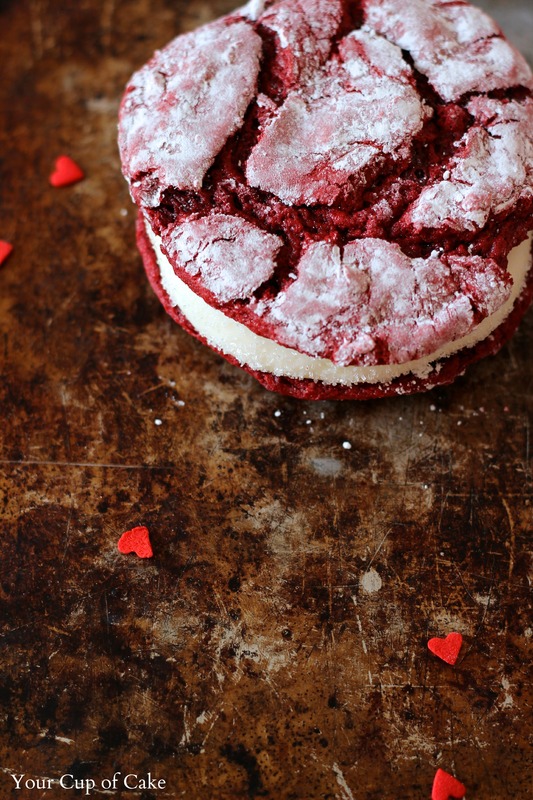 I am about to make these cookie (sandwich)!!!! 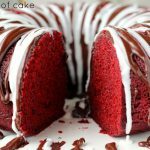 Because I feel like it AND red velvet is my favorite kind of cake! With the cream cheese frosting. Hi! 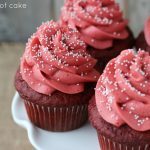 I’m from Brazil, here we don’t have a “box red velvet cake mix”, a can do a cupcake red velvet…. what can I do???? Just make a regular cookie (Like chocolate chip without the chocolate chip) add 1 Tbsp. cocoa powder and then a lot of red dye! Amazing.. Just finished making these. 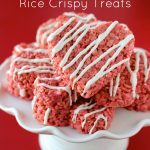 I stuck to the original recipe and love the way turned out! I honestly wouldn’t change a thing. 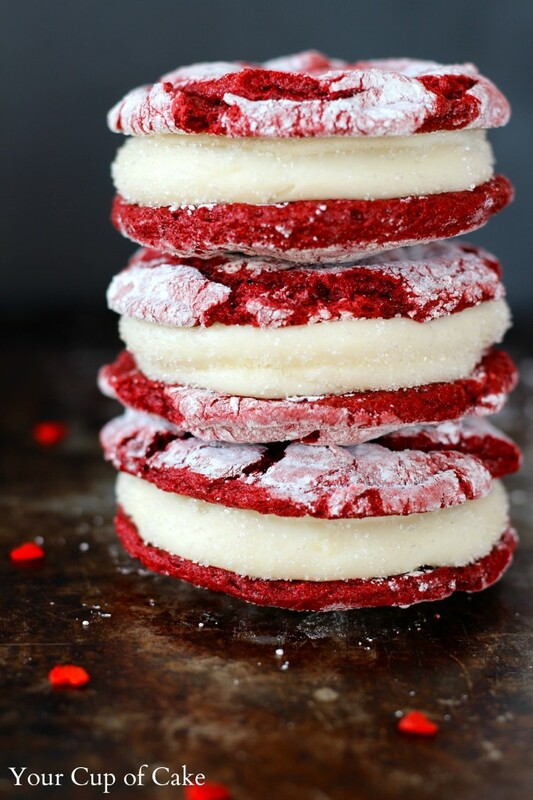 I’m looking forward to trying your “Red Velvet Cookies with Cream Cheese Filling” – question though, probably a dumb one but I just want to know. Do these “cookies” need to be kept refrigerated because of the cream cheese filling? 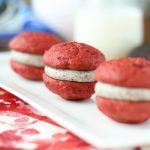 I like to refrigerate my whoopie pies all the time anyway because it makes the frosting thicker so that when you bite into the cookie sandwich, the frosting doesn’t gush out the sides. But you’ll be fine for 24 hours, more than that it’s a good idea to put them in the fridge. Would you ever put the cream cheese in the batter and then bake it? Like inside the batter? Well it wouldn’t be a cream cheese frosting, it would be some cream cheese, egg and a little sugar! 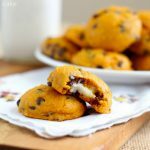 Forgive the thousand questions…if i don’t want the cream cheese as a frosting but instead want to bake it inside the cookie itself, I should mix the cream cheese with an egg and a little sugar? That’s simple enough for me, I think? Thanks for your help. 8 oz. cream cheese, 1 egg, 1/3 cup sugar! Though you will probably have extra cream cheese filling! 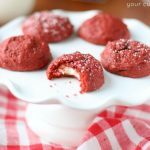 I LOVE cake mix cookies and these look just divine!! Pinned! Made them tonight for a cookie swap with my tennis team…….had to try one and it was delicious! These need to get into my mouth……immediately!!! Just ran into these on Pinterest! They look heavenly! Pinned! Hi I am wondering do you make the cake mix batter then add all other ingredients? Or just put cake mix powder in a bowl and ingredients? The latter! Just use the mix by itself and pay no attention to the box directions! No, it just can be really sticky, so putting it in the fridge helps to firm it up a little. I have a question. Did you dip the cookies in powered sugar or flour to get the white look on the top? Yes! I rolled the dough balls in powdered sugar and then laid them on the cookie sheet to bake! 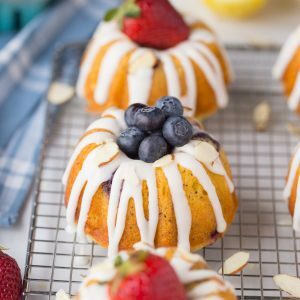 I was thinking about making these for a bake sale, but I’m wondering whether they can stay outside of the refrigerator for a day because of the cream cheese. Thanks! Yes, they will be fine! Which color scoop do you use for these? Regular milk is fine, but give buttermilk a shot next time! Another thing what kind of oil do i need to use, olive oil or vegetable oil? And for mixing the filling do i need the mixer or whisk? I use vegetable oil or canola oil! I use a stand mixer with the paddle attachment, but use what you have! Hi Lizzy Mae. Thanks so much for this recipe. It’s a hit every time we make it. My question is how do you get your cookies so flat? Ours round out much more and they are harder to eat. Thanks for any tips you can give me. as manoeuvrable as canisters. The attachments and unique design of the Bissell let you keep your home free of allergens and pet hair. article is truly nice, all be able to simply know it, Thanks a lot. weblog carries remarkable and truly fine data for visitors. I don’t live in the US. 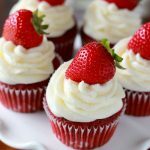 May I know 1 box of red velvet cake mix is equivalent to how many grams, thanks for another great recipe! I dont live in the US. May I know 1 box of red velvet cake mix is equivalent to how many grams, thanks for another great recipe. Especially after the SEO (search engine optimisation) world was rocked with the latest Google updates. There’s nothing more humiliating for a defense than not being able to stop the run. ” This was a 20 something young lad who was having fun doing something that he loves. – At one point during the 2005 season, Donovan Mc – Nabb threw nine consecutive touchdown passes of distances of seven yards or less. checking brand new gates for any happier potential. ottenere autentici legittimi occhiali Oakley. Will the actual cookie be hard or soft? example: suppose you had two bottles – a two-gallon jug and a 16 oz. This car is definitely the most fascinating! This car is definitely the number 1! top spot on the best Dragon Age 2 mods list. can i do it рlease assist. Game Content material and Materials Copyright Covet Style. 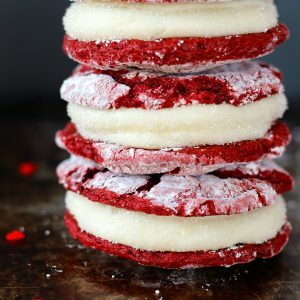 im a beginner in baking and my local stores dont sell red velvet cake mix, i cant locate your red velvet cookies from scratch, would appreciate if you can advise, please…. hehe i really wish to make this, it looks so yummy and with so many good comments, i cant wait. thanks..